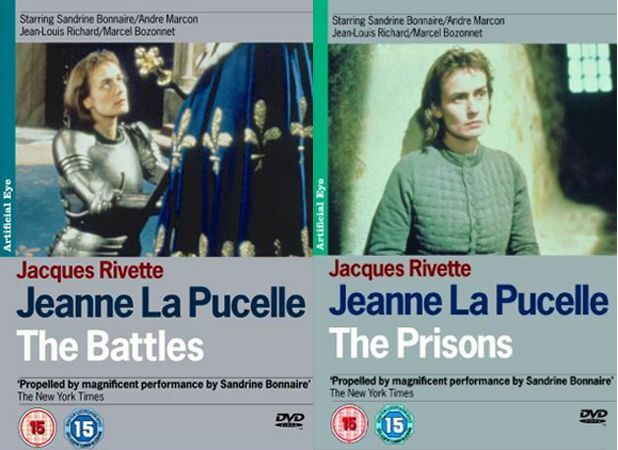 Following on from Carl Dreyer and Robert Bresson in exploring the story of Joan of Arc, Jacques Rivette offers an account of the martyr that is as political and gender oriented as it is spiritual in this 1995 two-film epic finally available on two separate standalone DVDs. Sandrine Bonnaire (Vagabond, Police) plays her as a matter-of-fact woman who dresses as a man and takes her orders from God almost the way one might consult an accountant or any lay expert, and as with many a Bonnaire role there is an earthy naturalness. For Rivette the divine and the devilish lie in the detail; it’s a five and a half hour account of Joan leaving her village, fighting for her king, and dying for God, King and country. If Dreyer’s film was famous for its use of close-ups, Bresson’s for its clipped editing, Rivette’s Jeanne la Pucelle is a work of mise-en-scene as the director tracks and zooms to capture the nuance of power relations in screen space. An epic of muted feeling, the film’s most telling and powerful line comes when Bonnaire mounts the steps to the stake and wonders where she will be by the evening. Minimal extras.